January 5, 2017 a Cedar City born and raised, religious leader, local business man, community advocate, state representative, scout leader, dedicated husband, father, grandfather and great grandfather peacefully passed away at the age of 92. Robert Haze Hunter, born October 5, 1924 to Charles R. and Ruth Hunter was third of five siblings; Forest, Winona (Cowan), Haze, Ruth Maria (Pendleton), and Mac. After a short college experience Haze married Betty Jean Benward, daughter of a local pharmacist. 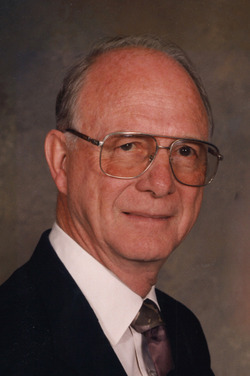 He then joined the Navy during WWII and was trained in Coeur d’Alene, Idaho as an operating room technician. Betty had an off base apartment as she supported Haze in his enlistment. After the war they came back to Cedar City where they tried their hand at farming and animal husbandry, but was most successful as a furniture retailer for more than fifty years. Haze was fully involved in the building of the community as city councilman, life time Lions Club member, state representative, hospital board member, and member of various community fund raising committees benefiting – among others – the Women’s Crisis Center, Heritage State Park, and the Sandra L. Maxwell Cancer Center. In his ten years as a statesman in the House of Representatives he was instrumental in procuring a significant amount of state funding for Southern Utah capital expenditures – including Southern Utah University building projects. Haze is survived by his wife of 73 years, Betty, daughters Danna Jones (Garth) of Cedar City, UT, Gay Baird (Phil) of Kanab, UT, and sons Kim (Terri Holt) of Cedar City, UT and Steve (Karen Knight, deceased) of Cedar City, UT, as well as fifty-one grand and great grandchildren. Haze was preceded in death by his parents, brother Forest, sister Winona, brother Mac and daughter-in-law Karen Knight Hunter. Funeral services will be held Saturday, January 14, 2017 at 12:00 pm at the R. Haze Hunter Conference Center on the Campus of Southern Utah University (351 West University Boulevard, Cedar City, Utah). A viewing will be held on Friday, January 13, 2017 at 6:00 pm to 8:00 pm at Southern Utah Mortuary (190 North 300 West, Cedar City, Utah). On Saturday, January 14, 2017 the viewing will be held at the R. Haze Hunter Conference Center from 9:30 am to 11:30 am. Interment will be in the Cedar City Cemetery under the direction of Southern Utah Mortuary. In lieu of flowers, please make donations to the Sandra L. Maxwell Cancer Center, 1303 North Main, Cedar City, UT 84720. Thanks goes out to the caring attention offered by the Southern Utah Home Healthcare staff, Beau and Erica Kunzler, and Jamie Nelson, as well as the tenderness shown Haze by Alliance Hospice Group.